In a speech, Sessions described an immigration system rife with “fraud and abuse” which paves the way for millions of immigrants to enter the country illegally. Sessions zeroed in on the asylum system in the United States, asserting that “dirty immigration lawyers” are coaching their clients to make “fake claims” to trigger “credible fear” proceedings so they can stay in the United States. 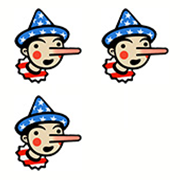 Regular readers of The Fact Checker may recall we’ve dug into Sessions rhetoric on immigration before, often giving him Pinocchios for statements that are thin on the facts. Is this just one more instance of Sessions’ inflammatory rhetoric or is the rise in new cases due primarily to fraud and lawyers, as he claims? Let’s take a look. Sessions asserts immigration lawyers are coaching their clients to use the “magic words to trigger the credible fear process” and stay in the United States. Let’s break this down. Most credible fear claims occur after a person is caught by Customs and Border Protection travelling through legal points of entry without proper paperwork or crossing the border illegally via land or sea. In these cases, the foreign national is detained and subject to an expedited deportation. But if the foreign national claims he or she would face persecution or torture should they return home, the removal process is halted while an immigration official determines the merit of the claim. If an official determines the subject has “credible fear,” the case is referred to an immigration Judge for a full hearing. As of 2009, immigrants determined to have a legitimate claim are eligible for parole from detention, provided they are not a security risk, as they wait their court date. To make his case that most of these claims are illegitimate, Sessions cites U.S. Citizenship and Immigration data on credible fear proceedings in the United States. In 2009, there were roughly 5,500 credible fear cases. By 2016, that number had skyrocketed to 94,000. Sessions is particularly concerned with the subset of cases in which people crossed over the border illegally and claimed fear of return. In 2016, these claims made up 69,000 of the total 94,000 cases. Are immigration lawyers to blame for this increase? Were not equipped to assess fraud in the asylum process in accordance with established guidelines. Were not able to identify patterns of fraud across asylum applications because the agencies used paper applications instead of electronic ones. Had not established clear fraud detection responsibilities for its immigration officers in asylum offices. However, the report does highlight a few documented cases of fraud, noting that from 2010 to 2014 USCIS terminated asylum status for 374 people because of fraud. And that a 2014 investigation in New York resulted in fraud charges against 30 individuals who were connected to roughly 4,500 asylum applications. Additionally, in 2014, an immigration consultant in Los Angeles, who had been linked to 800 asylum applications, pleaded guilty to document fraud, conspiracy and identity theft. To be clear, USCIS can’t know how widespread fraud in the asylum system is because they aren’t equipped to assess it. Sessions bases his claim on roughly 6,000 documented cases of fraud, committed by 31 consultants or lawyers. Because the report addresses the asylum system as a whole, it is impossible to know how many of these cases are credible fear claims. So far, Sessions’s evidence is thin. So what accounts for the surge in credible fear cases? Immigration experts say the rise in credible fear claims reflects the influx in people fleeing violence, and human rights abuses in Central America’s Northern Triangle – Guatemala, Honduras, and El Salvador. In 2016, as scores of women and children poured across the border, the Department of Homeland Security announced an initiative to help those escaping the “humanitarian crisis” and seeking refuge in the U.S.. Sessions takes particular issue with credible fear claims made by people crossing the border illegally. Since 2000, the number of people crossing the border illegally from countries other than Mexico has increased fourfold as the number of people from Mexico has steadily declined. It is a significant shift, as many emigrating from Mexico are considered economic migrants in search of better opportunities. And the credible fear claims reflect these immigration trends. A 2015 report from the Center for Immigration Studies, found that immigrants from El Salvador, Guatemala, and Honduras made up 80 percent of all new credible fear applications since 2014. Many of the people crossing the border illegally do so with the help of smugglers, commonly known as “coyotes.” Faye Hipsman, former policy analyst at Migration Policy Institute, said it’s the coyotes — not lawyers — who are likely coaching people crossing the border to make credible fear claims. That’s because expedited removal, the pre-requisite for credible fear claims, only applies to people picked up within 100 miles of the border who have been in the country for fewer than 14 days. The detainees can consult with lawyers or other counselors before their initial interview, but the interview takes place after the claim of credible fear is made. A 2013 report by Human Rights First found that nearly 80 percent of immigrants in detention centers do not have a lawyer during their immigration proceedings. In 2016, USCIS found that 80 percent of the 69,000 inland cases were legitimate, requiring a hearing in immigration court. These cases are reviewed by trained immigration officials, using guidelines set out by USCIS. In 2014, USCIS tightened the guidelines, adding that applicants must “demonstrate a substantial and realistic possibility of succeeding” in their cases. The Fact Checker documented these facts to DOJ, seeking a response. But we did not receive one. Sessions claims “dirty immigration lawyers,” are coaching their clients to make false claims to stay in the United States. But his claim rests on little evidence. The GAO report his spokesman cited details the challenges of evaluating how widespread fraud in the asylum system is. And Sessions seems to be confusing the details of the credible fear process. Most credible fear claims happen at the border without the consultation of lawyers. The data show that people from Central America, where violence and humanitarian abuses have surged, make up most of the credible fear claims. About 80 percent of the time, a trained immigration official ruled that the cases are legitimate, requiring a court ruling. Sessions lacks the evidence to make his claim but he uses the lack of evidence in a dubious way, filling in the missing pieces with inflammatory rhetoric on immigration fraud and casting immigration lawyers in a negative light. Until Sessions can point to concrete evidence of widespread fraud, he should refrain from making such sweeping and definitive statements. We award Sessions Three Pinocchios.